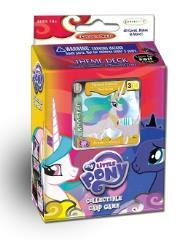 Canterlot Nights is the first expansion for the My Little Pony Collectible Card Game. Look for new gameplay, new main characters, great content and stunning new foil cards. 59-card theme deck, includes 2 special foil cards featuring Princess Celestia and Rarity, paper play mat, rules booklet, counter tokens & more! Build decks around one of the main characters and build a separate problem deck. Race to solve (yours and your opponent's) problems to earn points. First person to 15 points wins. This is an advanced and strategic card game, suggested for 10+.